Dr. Gobbler offers organic compost and yard mulch for ranches and nurseries in Centeral Texas, as well as surrounding areas. 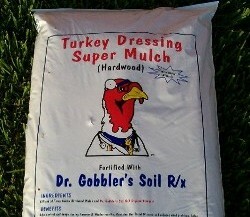 Our fertilizers are made from turkey litter we collect and process on our own farm. 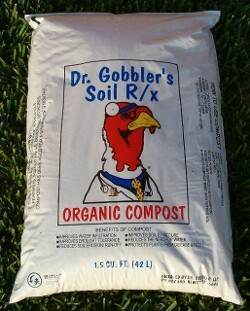 Grow your plants with our compost made from turkey litter, available in 1.5 cubic foot bags. We do not add any treated wood or green waste products to the starting material. In order to keep the material consistent, we do not change the feedstock. Our compost includes untreated pine wood shavings and rice hulls, which are installed in the barns to use as bedding for the birds. We remove the litter and pile it into large windrows, from 100 to 300 feet long and 20 feet wide. Water is added until the moisture content reaches 45 to 50%, which is then recorded, along with the temperature. Once the litter is ready according to the time and temperature requirements, we let it sit for 30 to 60 days to cure. This entire process takes between six to eight months to complete. Then we test samples through an STA-approved lab to ensure the process was properly completed. We screen and bag the material or ship in bulk directly to your nursery in 40 to 70 cubic yard loads. Receive the nutrients along with mulch moisture control all in the same blend. Our Turkey Dressing Super Mulch is made of Double Ground Hardwood combined with 30% of our soil compost and more than 25 additional minerals. In order to maintain freshness, we bag our mulch in two cubic foot bags, with 50 bags placed onto a pallet per skid. Our bulk mulch is available in 40 to 70 cubic-yard loads. For your convenience, we also offer our Texas Hardwood Mulch in bulk. Feed your crops with our organic compost and protect them with our nutritious yard mulch.